One of my main New Year resolutions is to get organized. I am so tired of the house getting messy so soon after I clean it, and part of that is due to there not being a specific place for everything. Take our pantry for example. It is pretty small as far as pantries go, and there was never enough room for everything on the shelves, so stuff just got shoved and stacked on top of each other. It didn't matter how often I straightened it up, it was back to being a mess a few days later. 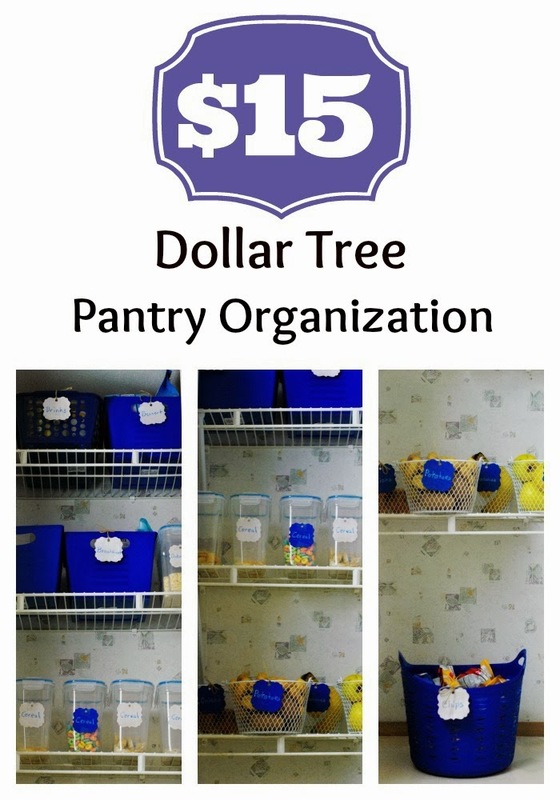 I am working on a tight budget, so I headed to the Dollar Tree, picked up $15 worth of bins, and had my pantry organized in no time! First, I will show you the shameful before shot. This my friends is what happens when you let boys put things away when they don't have a specific place. See what I mean? When there was no more room, things just got piled up. When you go to the Dollar Tree, what you see is what you get. What does this mean? It means they usually don't have more stock in the back, so what is on the shelf is all there is. I purchased three of the royal blue solid bins, and wanted a fourth, but there wasn't one, so I went with a royal blue plastic basket that had some holes in it. In the future, if I see another solid bin I will just buy it and swap them out. White wire baskets were purchased to hold, potatoes, onions, apples and bananas, things that actually last longer in my pantry and free up space in the fridge. A big blue plastic basket was bought to hold chips at the bottom, since we buy a large supply of single serve bags at once. To round out the pantry, I found a bunch of tall plastic food canisters that have the spout that pops up for easy pouring. This worked well for cereal, pancake mix, oatmeal and even pasta. When I started organizing the products in my pantry, I thought in terms of things that could be grouped together. This pantry holds mostly our breakfast, lunch and dessert items, while a set of shelves in the laundry room hold our canned goods, dinner and baking items. Once organized into like products, I labeled each basket with some cardboard gift tags I had bought on clearance at Michael's and painted in matching colors. Easy peasy pantry organization, and it didn't break the bank! How are you getting organized in the New Year? I'm going to go to my Dollar Tree tomorrow to look for those cereal containers! I plan on doing something like this when we move to stay organized. WHAT! I need to go to mine tomorrow I love the baskets and bins! I did my pantry with Dollar Tree items last year. I love that store! I'm still working on Playroom organization .... my pantry and spice cabinets are next on the list. It looks great! I am actually cleaning out my pantry tomorrow because it looks like your "before"- actually, much worse! But my stuff doesn't have "homes" either- maybe a quick run to the store is in order first! What a difference! I need to get more organized this year! You did a great job on this project and for so cheap! My pantry looks like your before picture. I love how organized everything is, I definitely need to do this in my bathroom! That does look nice and organized now. My pantry is a mess! I need to get some of those containers. Don't you just love the Dollar Tree! I love what you have done with your pantry. Just one more reason to love the Dollar Tree! I need some containers, so I'm making a trip there tomorrow! Great post! Both my sister and I have been meaning to organize our pantries like this for awhile now and it's so cool to know there are cheap container solutions available. I need to do this. One thing I implemented this year was a magnetized whiteboard on our freezer. Now I have written on it everything that's in the freezer and when I take something out I wipe it off the list. When we go grocery shopping I add to the list. At a glance I can see if we're out of corn, chicken or bread - plus if I freeze leftovers I can use them before they get lost at the bottom of the freezer never to see the light of day before the package is 'burnt' and yucky. I love organization. Your pantry looks great. Great ideas! The dollar store overwhelms me when I'm in there, so planning ahead is great. Saw this on Pinterest! How long will potatoes and apples last when they aren't refrigerated? I desperately need to visit Dollar Tree this week!I love that place!How could you have only spent $15? It seems like you bought more than 15 things. Polly, the apples and potatoes last weeks in the pantry, if the boys let them last that long. :) There are only 16 containers in the photos. We had one of the clear plastic little cereal containers already, the other 15 items were $1 each. If you're buying in bulk (like the cereal containers) you can puchase items by the case at dollartree.com. have it shipped to the store for free shipping ;) if you have a larger pantry like I do, you could even buy the bins inmatching colors/styles by the case, too. Thank you for all of the great ideas. What did you use in your laundry room to organize the can goods? I used the colored plastic baskets from the Dollar Tree.